Description: In a soft touch koskin leather look pebble grain material. Front strip in bonded leather with white contrast stitching and metal badge. 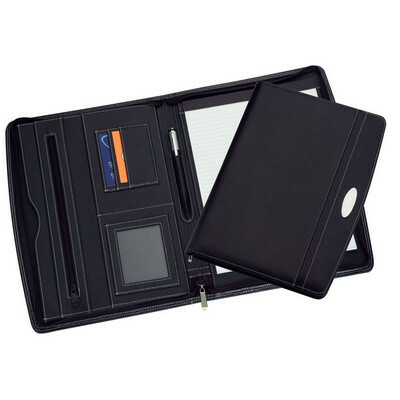 Features: Features zippered closure, internal gusseted pocket, internal zippered pocket, business card holders, pen loop and lined pad which inserts from the top. Pen not included. Metal badge engraves silver. ?Check out our Tablet Compatibility chart to see which tablets fit in the product. Packaging: In a polybag and presented in a plain black tuck box. ?Packaging Size: 375mm(h) x 275mm(w) x 30mm(d) Colour: Black. Material: Koskin leather look pebble grain material and metal badge Product Size: 350mm(h) x 260mm(w) - Badge: 60mm(w) x 20mm(h) Freight details : 15 per carton, 16.5kgs, 56 x 30 x 40cms; Decoration Type(s): Colour Print / Deboss / Debossed Foil / Foil Stamp / Full Colour Print / Laser Engrave / Print with Dome Decoration Area: Laser - On Bage: 35mm(h) x 12mm(w). ?Screen - On Front: 120mm(h) x 150mm(w). ?Other Methods: Contact your decorator for applicability and size. Price includes : 1 Colour 1 Position Print. Setup is included.